Slender and shiny silver or grey, with long antennae and three tail-like appendages in back; 1/2- to 1 inch. Silverfish prefer warm, damp, undisturbed areas and may go undetected for years. They live in cracks and voids and are commonly found in attics, basements and crawl spaces. Because they feed on fungal moulds and organic matter, they are also seen regularly in kitchens and bathrooms. They can damage fabrics, paper and book bindings. Moulds and starchy materials like cereals, flour, sweet foods, paper, curtains and wallpaper. Silverfish are one of the hardest insects to control, especially in homes with wood shake (shingle) roofs. Shakes mould moisture and allow for mould to grow, which serves as food for silverfish. Treatment of cracks and voids as well as attic and crawl spaces is necessary to minimize silverfish. 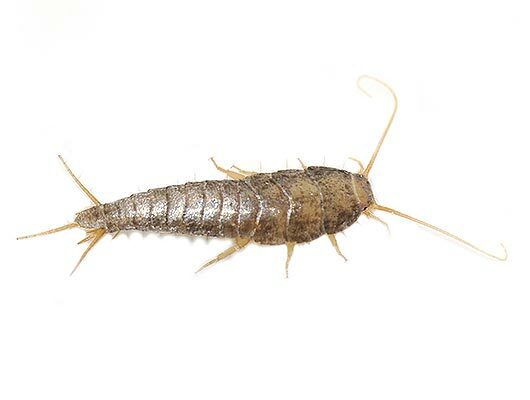 Because they can live in hard-to-treat spaces such as in soffits, behind fascia boards and under shingles, professional treatment is a must when silverfish are a regular problem.